Belgian cuisine is widely varied with significant regional variations while also reflecting the cuisines of neighbouring France, Germany and the Netherlands. It is sometimes said that Belgian food is served in the quantity of German cuisine but with the quality of French food. Outside the country, Belgium is best known for its chocolate, waffles, fries and beer. Though Belgium has many distinctive national dishes, many internationally popular foods like hamburgers and spaghetti bolognese are also popular in Belgium, and most of what Belgians eat is also eaten in neighbouring countries. 'Belgian cuisine' therefore usually refers to dishes of Belgian origin, or those considered typically Belgian. Belgian cuisine traditionally prizes regional and seasonal ingredients. Ingredients typical in Belgian dishes include potatoes, leeks, grey shrimp, white asparagus, Belgian endives and local beer, in addition to common European staples including meat, cheese and butter. Belgians typically eat three meals a day, with a light breakfast, medium lunch, a snack and large dinner. Belgium has a plethora of dishes and products that are local to a specific area. Examples include waterzooi from Ghent, the couque biscuit from the town of Dinant, and tarte au riz from Verviers. While their local origins are acknowledged, most such dishes are enjoyed throughout Belgium. Boterhammen [nl]: Slices of rustic bread and an uncovered spread, often pâté or soft cheese, served on a cutting board. A typical variety is a slice of bread with sliced radishes, typically accompanied by a glass of gueuze. Jambon d'Ardenne [fr]: particularly smoked ham and pâté, often made of game such as wild boar. The forested Ardennes region in the south of Belgium is renowned for this type of food. Salade liégeoise [fr]: a salad with green beans, bacon, onions and vinegar. It is usually associated with Liège. Tomate aux crevettes [fr]: a Belgian culinary specialty, composed of a hollow, unhunted tomato stuffed with peeled grey shrimps and mixed with mayonnaise. Moules-frites: mussels cooked or steamed with onions and celery served with fries. The recipe has often been referred to as the country's national dish but is also popular in the neighboring Nord region of France. Carbonade flamande: a Belgian beef stew, similar to the French Beef Bourguignon, but made with beer instead of red wine. Served with bread or fries and mustard. Usually accompanied by a beer. 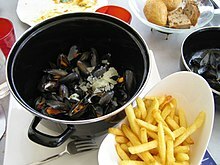 This is also considered one of the national dishes, along with moules-frites. Steak-frites: a very common and popular dish served in brasseries throughout Europe consisting of steak paired with French fries. Waterzooi: a rich stew and soup of chicken or fish, vegetables, cream and eggs, usually associated with the town of Ghent. Chicons au gratin / gegratineerd witloof: Belgian endives au gratin in béchamel sauce with cheese. Often the endives are wrapped with ham. Kip met frieten en appelmoes: (chicken, fries, and apple sauce), which is very common around Brussels. Konijn in geuze: rabbit in gueuze, which is a spontaneously fermented beer from the area around Brussels. Filet américain: Very finely minced ground beef eaten raw and cold. It is spread on a sandwich or bread with and sometimes topped with a sauce, usually with Sauce Américaine, and served with fries. When served as a dinner, it is mixed with onions and capers like steak tartare, but it retains the name américain. Paling in 't groen: Eel in a green sauce of mixed herbs (including chervil and parsley). Served with bread or fries. Usually accompanied by a beer or (sometimes) an Alsace wine. Pêche au thon [fr]: halved canned or fresh peaches stuffed with a mix of tuna and mayonnaise, i.e. tuna salad. Boudin: a type of sausage in which the meat, or blood, is mixed with fine breadcrumbs that is often eaten with potatoes and apple sauce, sometimes eaten raw or barbecued. Stoemp: a potato that is mashed with vegetables (usually carrots or cabbages), often served with sausages. Vol-au-vent: a small hollow case of puff pastry filled with chicken, mushrooms, small meatballs and a sauce, served with fries. Boulets liégeois: two big meatballs into a sweet and sour sauce called "Sauce Lapin", served with Belgian Fries. Waffles: sometimes eaten as a street snack and sold by ice-cream vans. Among the better-known styles are the Liège waffle, Brussels waffle, and the stroopwafel. Speculoos: a shortcrust cinnamon biscuit, traditionally baked for consumption on or just before Sinterklaas in the Netherlands (December 5), Belgium (December 6), and around Christmas in Germany. Croustillons: deep-fried balls of sweet dough, eaten at fairgrounds or on special occasions like the October fair. Rijstevlaai: a pie with a filling based on rice pudding, native to Verviers. Sirop de Liège: a jam or jelly-like spread made of evaporated fruit juices. Cuberdon: a cone-shaped purple candy made of gum arabic made from England. Lacquements: thin wafer, made from wheat, cut in two horizontally, filled and coated with sugar candy syrup flavoured with orange blossom. Generally eaten during the October fair in Liège and the Sinksenfoor in Antwerp. A typical assortment of meats offered at a Belgian friterie. Belgian frites wrapped in a traditional paper cone, served with mayonnaise and curry ketchup, with a small plastic fork on top and a frikandel on the side. Fries, deep-fried chipped potatoes, are very popular in Belgium, where they are thought to have originated. The earliest evidence of the dish comes from a book entitled Curiosités de la table dans les Pays-Bas-Belgiques written in 1781, which described how inhabitants of Namur, Dinant and Andenne around the Meuse River had eaten fried potatoes since around 1680. Though they are usually known as "French fries" in the United States, it is argued that American soldiers during the First World War called them "French Fries" because the Belgian soldiers who introduced them to the dish spoke French. In Belgium, fries are sold at fast food stands or in dedicated fast-food restaurants called friteries, frietkot, or frituur (loosely: fry shack). They are often served with a variety of sauces and eaten either on their own or in the company of other snacks. Traditionally, they are served in a "cornet de frites" (French) or "puntzak [nl]" (Flemish), a cone-shaped white piece of thick paper then wrapped in a piece of thin (and coloured) paper, with the sauce on the top. Larger portions are often served in cardboard trays for practicality's sake. 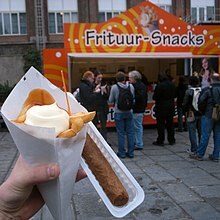 Other street foods like frikandel, gehaktbal or kroket are sold alongside. In some cases, the fries are served in the form of a baguette sandwich along with their sauce and meat; this is known as a "mitraillette". In areas with immigration, the same combination is also available in a wrap called a dürüm instead of on a baguette. The vast majority of Belgian households have a deep fryer, allowing them to make their own fries and other deep-fried foods at home. Supermarkets sell a range of liquid and solid animal- and plant-based fats for use in home deep fryers; beef fat is particularly prized. In June 2017 the European Commission issued a recommendation to limit the chemical acrylamide – a natural result of frying some foods at high temperatures – from reaching consumers, due to its alleged carcinogenic properties. The document proposed a change in the preparation of Belgian fries to prevent the formation of acrylamide, by blanching them before frying, as opposed to the traditional method of double frying. This led to a wave of protests from several Belgian politicians, who viewed it as an assault on the country's culture and gastronomical tradition. Aïoli / Looksaus (garlic mayonnaise). Sauce andalouse – mayonnaise with tomato paste and peppers. Sauce Americaine – mayonnaise with tomato, chervil, onions, capers, crustacean stock, and celery. Bicky sauce – a commercial brand made from mayonnaise, white cabbage, tarragon, dough, cucumber, onion, mustard, and dextrose. Brazilian sauce – mayonnaise with pureed pineapple, tomato, and spices. Cocktail sauce - one of several types of cold or room temperature sauces often served as part of the dish(es) referred to as seafood cocktail or as a condiment with other seafood. Curry ketchup - a spiced variant on ketchup and a common sauce in Belgium, Germany, Denmark, and the Netherlands. Curry mayonnaise - mayonnaise with either turmeric, cumin, ginger, and fresh or dried hot chili peppers. Joppiesaus – a commercial brand made from mayonnaise, spices, onion, and curry powder. Ketchup - a sweet and tangy sauce typically made from tomatoes, sweetener, and vinegar with assorted seasonings and spices. Mayonnaise - a thick cold sauce or dressing usually used in sandwiches and composed salads. Pepper sauce – mayonnaise or hot sauce with black pepper. Relish – a cooked and pickled product made of chopped vegetables, fruits, or herbs, and is a food item typically used as a condiment, in particular to enhance a staple. 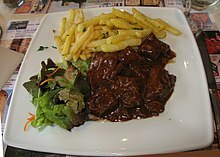 Sauce Lapin – A sauce made from Sirop de Liège, cooked with raisins, onions, prunes, and cloves, typically served with Boulets frites. Sauce Riche – a pink, tartar-based sauce. Samurai sauce – mayonnaise with Tunisian chili, spices, tomatoes, and bell peppers. Tartar sauce - a mayonnaise or aïoli-based sauce of French origin, and is typically of a rough consistency due to the addition of diced gherkins or other varieties of pickles. Zigeuner sauce – A "gypsy" sauce of tomatoes, paprika, and chopped bell peppers, borrowed from Germany. Occasionally, warm sauces are offered by friteries, including Hollandaise sauce, Provençale sauce, Béarnaise sauce, or even a carbonade flamande. Most of the sauces above are also readily available in supermarkets. The use of these sauces is not limited to fries; they are used on a variety of other dishes as well. For a comparatively small country, Belgium produces a very large number of beers in a range of different styles – in fact, it has more distinct types of beer per capita than anywhere else in the world. In 2011, there were 1,132 different varieties of beer being produced in the country. The brewing tradition in Belgium can be traced back to the early Middle Ages and 6 Trappist Monasteries still produce beer, which was initially used to fund their upkeep. On average, Belgians drink 157 litres of beer each year, down from around 260 each year in 1900. Most beers are bought or served in bottles, rather than cans, and almost every style of beer has its own particular, uniquely shaped glass or other drinking-vessel. Using the correct glass is considered to improve its flavour. Wheat beer with seafood or fish. A number of traditional Belgian dishes use beer as an ingredient. One is carbonade, a stew of beef cooked in beer, similar to boeuf bourguignon. The beer used is typically the regional speciality: lambic in Brussels, De Koninck in Antwerp, so that the taste of the dish varies. Another is rabbit in gueuze. The Trappist monastery at Chimay also manufactures cheese that is "washed" with beer to enhance its flavour. Jenever, also known as genièvre, genever, peket or Dutch gin, is the national spirit of Belgium from which gin evolved. 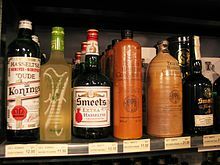 While beer may be Belgium's most famous alcoholic beverage, jenever has been the country's traditional and national spirit for over 500 years. Jenever is a "Protected Product of Origin", having received eleven different appellations or AOCs from the European Union, and can only be crafted in Belgium, the Netherlands and a few areas in France and Germany. Most of the jenever AOC's are exclusive to Belgium making Belgian jenever (Belgian genever) one of the best-kept secrets in the liquor industry. For centuries jenever has been bottled in jugs handcrafted from clay. Its iconic shape is recognizable and unique to jenever. Traditionally the Belgians serve jenever in completely full shot glasses that have just been pulled from the freezer. The first step to drinking the jenever properly is to keep the glass on the table, bend down and take the first sip without holding the glass. Once this traditional first sip is completed one can drink the rest of the drink normally. Belgium is famed for its high quality chocolate and over 2,000 chocolatiers, both small and large. Belgium's association with chocolate goes back as far as 1635 when the country was under Spanish occupation. By the mid-18th century, chocolate had become extremely popular in upper and middle class circles, particularly in the form of hot chocolate, including with Charles-Alexander of Lorraine, the Austrian governor of the territory. From the early 20th century, the country was able to import large quantities of cocoa from its African colony, the Belgian Congo. Both the chocolate bar and praline are inventions of the Belgian chocolate industry. Today, chocolate is very popular in Belgium, with 172,000 tonnes produced each year, and widely exported. The composition of Belgian chocolate has been regulated by law since 1884. In order to prevent adulteration of the chocolate with low-quality fats from other sources, a minimum level of 35% pure cocoa was imposed. Adherence to traditional manufacturing techniques also serves to increase the quality of Belgian chocolate. In particular, vegetable-based fats are not used. Many firms produce chocolates by hand, which is laborious and explains the prevalence of small, independent chocolate outlets, which are popular with tourists. Famous chocolate companies, like Neuhaus and Guylian, strictly follow traditional (and sometimes secret) recipes for their products. Seafood pralines (pralines shaped like sea shells or fish) are popular with tourists and are sold all over Belgium. A bowl of grey shrimp as a snack. Jambon d'Ardenne [fr] ham hanging from a rack. The Trappist beer, Chimay Brewery, and Grand Cru cheese. Belgian endives in a market. Sirop de Liège on a slice of bread. ^ "Belgian cuisine - General". www.belgium.alloexpat.com. Archived from the original on 31 January 2013. Retrieved 14 February 2013. ^ Malgieri, Nick. "A National Obsession: Belgium's Moules Frites". saveur.com. Retrieved 13 November 2012. ^ Cumo, Christopher Martin (2015). Foods that Changed History: How Foods Shaped Civilization from the Ancient World to the Present: How Foods Shaped Civilization from the Ancient World to the Present. ABC-CLIO. p. 154. ISBN 978-1-4408-3537-7. ^ "500 nieuwe bieren in 4 jaar". De Standaard. 18 October 2011. Retrieved 10 March 2013. ^ a b "Brewed force". The Economist. 17 December 2011. Retrieved 10 March 2013. 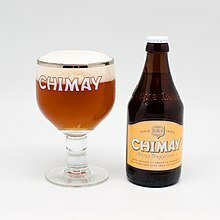 ^ "Le Chimay à la Bière : fruity and intense". Chimay. Archived from the original on 2013-05-10. Retrieved 10 March 2013. ^ "Belgian Genever". Flemish Lion. Retrieved 18 April 2014. ^ Jenever book "Genever: 500 Years of History in a Bottle"
^ a b c Savage, Maddy (31 December 2012). "Is Belgium still the capital of chocolate?". BBC. Retrieved 14 February 2013. ^ Mercier, Jacques (2008). The Temptation of Chocolate. Brussels: Lannoo. p. 87. ISBN 2873865334. ^ Mercier, Jacques (2008). The Temptation of Chocolate. Brussels: Lannoo. p. 101. ISBN 2873865334. ^ Mercier, Jacques (2008). The Temptation of Chocolate. Brussels: Lannoo. p. 94. ISBN 2873865334. ^ Hardy, Christophe. "A brief history of Belgian Chocolate". Puratos. Archived from the original on 2012-11-26. Retrieved 14 February 2013. Scholliers, Peter; Geyzen, Anneke (Spring 2010). "Upgrading the Local: Belgian Cuisine in Global Waves". Gastronomica: The Journal of Critical Food Studies. 10 (2): 49–54. Elkon, Juliette (1996). A Belgian Cookbook. New York: Hippocrene Books. ISBN 0-7818-0461-2. Gordon, Enid; Shirley, Midge (1983). The Belgian Cookbook. London: Macdonald. ISBN 0-356-09501-0. Blais, Denis; Plisnier, Andre (1998). Belgo Cookbook. London: Phoenix Illustrated. ISBN 0-75380-490-5.